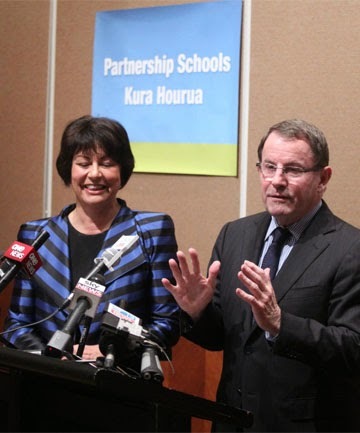 Charter Schools were always on National's secret agenda. Lesley Longstone was appointed to the job of Education Secretary because of her background in establishing UK's equivalent of Charter Schools (Free Schools). National had not campaigned on introducing Charter Schools but it was obviously always their intention to introduce them. John Banks was probably as surprised as everyone else when Charter Schools appeared in his coalition agreement with National, (ACT had not campaigned on them either). It was useful for National to have a disposable ally to force these public/private schools onto our public system. The Charter School introduction has been plagued by set backs. Lesley Longstone may have had useful knowledge about Charter Schools, but she struggled with everything else she was expected to do. Longstone's exit was costly. She earned around $1 million dollars for her 15 months on the job (initially a five year contract) when you include her salary and add on the $267,953 severance pay and $157,523 outstanding holiday pay she received on leaving. John Banks was the Minister with the responsibility for Charter Schools but he had to resign his post while facing charges over electoral fraud. Act supporter Catherine Isaac was appointed to manage the Charter Schools introduction despite having a limited education background and she found the public meetings promoting the concept challenging. New Zealand has been advised not to introduce Charter Schools by US education experts who had witnessed their failure. Isaac has claimed that they are introducing a successful model but it is difficult to find one as they appear to have failed in any country that has used them. Of the 36 expressions of interest in starting a Charter (or Partnership) School only five were deemed viable and even then I have heard doubts about the expertise in some of them. $19 million of taxpayer money will be spent on these experimental schools (almost $4 million per school). Minister Parata has decided to push on with investing in even more Charter Schools well before the value of the first ones have been analysed. As with most that National does, ideology always comes before evidence and reason. We would never let an unqualified person fix the wiring in our house but happily sit and let unqualified people educate our greatest investment. Interesting.